Area X has been cut off from the rest of the continent for decades. Nature has reclaimed the last vestiges of human civilization. The first expedition returned with reports of a pristine, Edenic landscape; all the members of the second expedition committed suicide; the third expedition died in a hail of gunfire as its members turned on one another; the members of the eleventh expedition returned as shadows of their former selves, and within months of their return, all had died of aggressive cancer. This is the twelfth expedition. Their group is made up of four women: an anthropologist; a surveyor; a psychologist, the de facto leader; and our narrator, a biologist. Their mission is to map the terrain and collect specimens; to record all their observations, scientific and otherwise, of their surroundings and of one another; and, above all, to avoid being contaminated by Area X itself. They arrive expecting the unexpected, and Area X delivers—they discover a massive topographic anomaly and life forms that surpass understanding—but it’s the surprises that came across the border with them, and the secrets the expedition members are keeping from one another, that change everything. 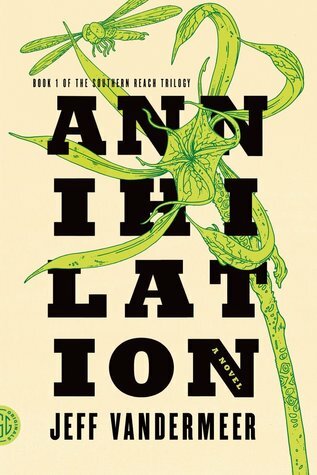 Annihilation takes the cake as one of the creepiest books I’ve read recently. I was thoroughly creeped out from the opening pages and nothing had happened yet, just description of landscape. Now that’s good writing! As intrigued as I was, I wasn’t sure I was going to finish this book. I didn’t think I could handle it. But then, when I wasn’t home alone, I finished the rest of the book in one sitting. If you’ve seen other reviews for this book, you know it opens a Pandora’s box of questions without bothering to solve much of anything at all. Good thing I got copies of the next two books, Authority and Acceptance, right away. I believe all three books originally came out within a few months of each other. Which was a good move on the publisher’s part. These books need to be binge-read together. If you’re considering reading Annihilation, do yourself a favor and buy all three books.